The number of drivers has steadily declined across the state, especially in the longhaul sector, according to data from the Colorado Department of Labor and Employment. But even as the pool for licensed commercial drivers is drying up, wages have steadily increased. Companies have upped pay and benefits to entice workers into the industry with varying degrees of success. The income increase has helped drivers but could lead to price bumps for many everyday consumer goods. “Businesses really have to be creative to entice people who really haven’t been in trucking before,” said Ryan Gedney, senior economist at the Colorado Department of Labor and Employment. Mike Euglow, CEO and owner of Commercial Vehicle Training Center in Watkins, Colo., said there are rewards for those willing to put in the hours and the work. But that’s not always an attractive sale for the average Joe. Stepping into that void are more immigrants and refugees. Many of the students at Euglow’s training center, which is east of Denver on Interstate 70, are East African and Afghan. When he arrived in the United States in 1996, he was just happy to be alive. Ahmed came to America as a refugee fleeing a bloody conflict and civil unrest in Somalia. As that country crumbled under the weight of upheaval, the United States offered a haven and truck driving offered a successful career path. He bounced across the country, living in nine different states before settling in Colorado. He loved the ocean in Southern California, the beauty of the Southwest and the flat expanse of Kansas, but the mountain landscape has been home for the past two decades. “You don’t have an ocean, but you can’t have everything,” Ahmed said about Colorado. 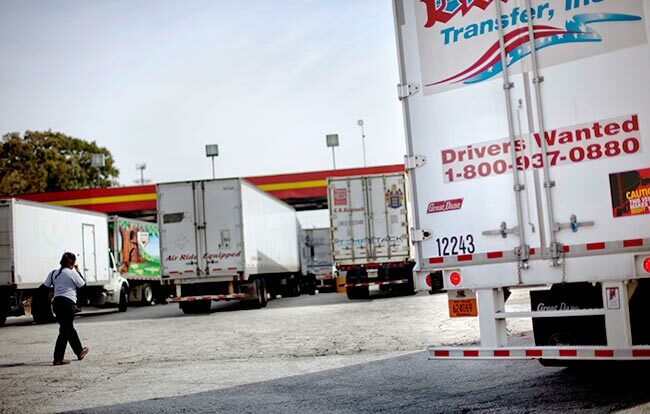 He encourages fellow members of the refugee community to give trucking a try. For him, it has allowed him to get paid to travel and feel a strong sense of purpose. When driving a route to a grocery store, he thinks about the communities he is servicing. “If you know what you are doing, it is a lot of fun,” he said. He now works four days a week as an instructor at the Commercial Vehicle Training Center with Euglow but has dreams of having his own school one day. He offers experience as a driver and fluency in English and Somali, important skills in the changing industry. “It helps a lot to have people who speak the same language,” he said. “We accept everyone; we don’t discriminate,” Euglow said. With new drivers coming from many different places, Euglow has made an effort to have training schedules be flexible for students’ needs and to have instructors like Ahmed who can offer a cultural bridge. The result has been weekslong waiting lists for enrollment and driving tests. Euglow’s long lines for training is unique in some ways, but for other states with different commercial-driving regulations, long wait times is part of the problem trying to attract new drivers. In Colorado, new drivers can take their driving test through a third-party tester. But not all states have such “sensible” laws, said Don Lefeve, CEO of the Commercial Vehicle Training Association. In states that require tests be administered through a state agency, the wait times can be a big hurdle to filling empty driver seats. Another problem is inconsistent regulations across states. To carry goods that are going to travel across state lines, a driver must be 21, according to federal regulation. In states that allow commercial driving at 18, such as Colorado, they are limited only to goods made in the state and that will stay in the state, a sliver of the total amount of goods that the U.S. economy moves each year. Procter & Gamble, maker of common consumer products including Tide detergent and Pampers diapers, is having to raise prices on some products due to increased transportation costs, according to Bloomberg News. The company recently saw a 25% jump in trucking costs. Also looming over the industry is the coming of advanced technology such as artificial intelligence. While there is concern that one day driverless trucks will take over highways from human drivers, those in the industry are pragmatic about their prospects. “Given all the complexity, you really are going to need humans through 2040-50,” Lefeve said. AI has several hurdles from technological development, government regulation and security from hackers before wide-spread implementation could become a reality. While companies and the government work to develop AI, human drivers will remain an integral part of the trucking industry, Lefeve said. At the driving school in Watkins, instructors are looking to the future and starting to research how to train drivers to be test pilots. The length of time needed to develop AI will give the industry time to adjust. But, even in best-case-scenario projections, some drivers will be pushed out by ones and zeros, Gedney said. In Colorado, about 53% of drivers are 45 or older — in all other industries that age group represents 42% of the workforce. About 66% of truck drivers have a high school degree or less, according to data from Gedney. The combination of an older workforce with less education will make the challenge of retraining even more daunting. “There is a real concern about how do you retrain these individuals,” Gedney said.